The noose is a surprisingly easy knot to tie. Other than making an obvious allusion to suicide, I also chose to draw it slightly loose as a comment on resolve (or lack thereof) to match the tone of the quotation. 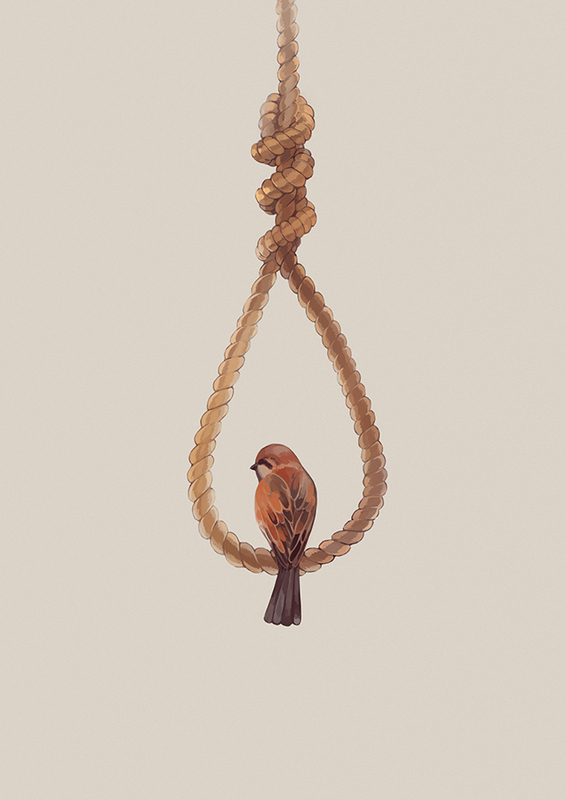 Even a loose noose should be able to support the weight of a flighty sparrow. In Greek mythology, sparrows are one of several bird species sacred to Aphrodite, the goddess of love. As a fairly commonplace bird in modern times, sparrows can also be associated with vulgarity or lewdness. Faced with that scrawny destiny, I remembered a real death. That of a gardener, who said to me: ‘You know, I used to sweat sometmes when I was digging. My rheumatism would tug at my leg, and I used to curse my slavery. Well today, what I’d like to do is dig. Dig the earth. Digging seems so beautiful now! You’re so free when you're digging! And who’s going to prune my trees now?’ He was leaving fallow land behind him. A planet lying fallow. He was bound by ties of love to all the soils and all the trees of the earth. He was the generous man, the man who gave unstintingly, the noble lord! He was a man of courage, like Guillaumet, battling against death in the name of his Creation. on the order of a violent toothache. It has nothing to do with love.